Already packing your suitcase for Germany? 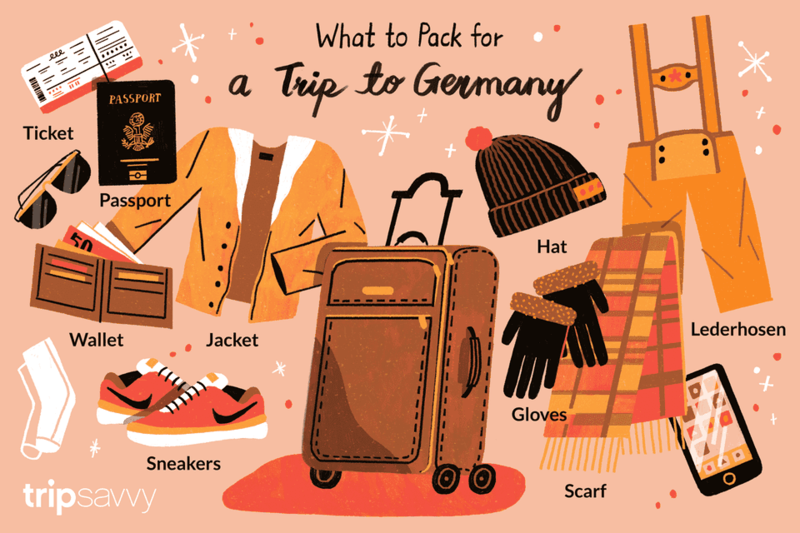 Stop for a minute and look at this helpful packing list that features must-have travel goods for your trip to Germany. For rain, for sun, for snow, for Oktoberfest, for Germany's many different seasons - sometimes all in one day - this packing list for Germany is an essential element of planning your trip to Germany. You can also print this list out and use it while packing - just cross out the listed items after you packed them. And don’t worry, if you forget something at home you will be able to buy most things in Germany's many shops (as well as picking up unique gifts to take home). Smart Phone - This indispensable item has become many traveler's everything - map, camera, guide book, wallet, etc. Be aware of roaming charges with your company and investigate if it needs to be unlocked to use a foreign sim card (the best solution for a long-term stay in Germany). Wi-fi is plentiful in Germany, although still more limited than in places like the USA. Medicine - While most things you leave behind can be purchased in Germany, you should know that some common over-the counter goods aren't available. You need to go to the pharmacy for things as simple as antacids and they will probably carry different brands than you are used to. If there is anything you can't live without - bring it with you. Toiletries - Ttoothbrush, toothpaste, lotions, shampoo, shower gel, razor, shaving cream, etc. Good walking shoes - While that seems to translate to sneakers for most Americans, note that most Europeans prefer real shoes and boots. For those that wear heels, note that the country's many cobblestone streets make that shoewear a challenge. Layers - The weather in Germany can change quite quickly. Scarf - Men and women wear scarfs throughout the year, especially in fall and winter. On the other hand, German summers can be quite hot. Lederhosen: This actually only refers to the traditional Bavarian pants, but the whole outfit usually includes a white or colorful checked shirt with sturdy buttons, knee-high cable-knit socks, Haferlshuhe which tie up the side and even a jacket and hat.